Etsy vendors helped me immensely as I planned our Maui wedding. I gravitated toward romantic, floral designs in everything I ordered — to match my new last name. 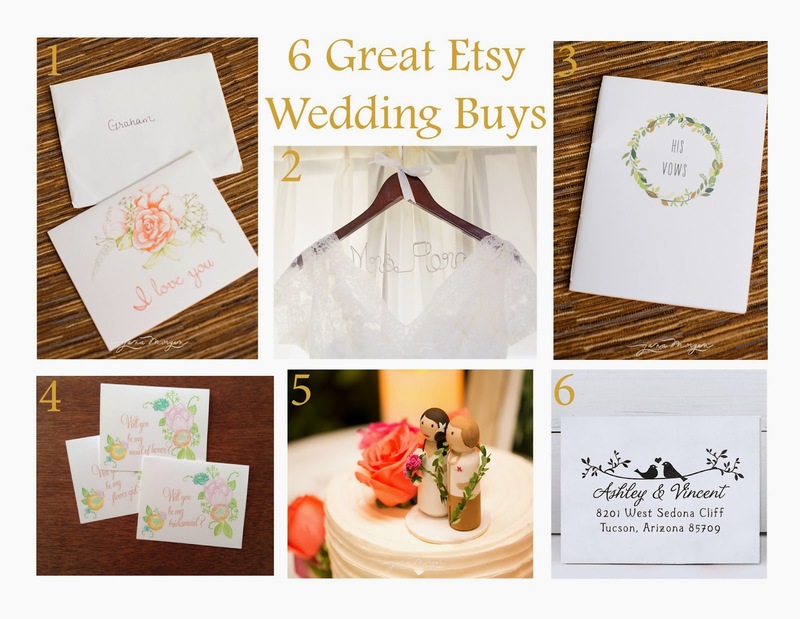 In the age of Pinterest, it’s easy to get carried away with DIY, but chances are there’s an item on Etsy that is both beautiful and reasonably priced. And vendors will often customize your item if you request it. 1. Natty Michelle card for Graham. This was originally a Mother’s Day card that I requested she change to say “I love you.” She happily agreed. 2. Bridal hanger from Passion and Love. I was hesitant to buy this because there are seemingly thousands of options for bridal hangers, but mine was nicely made. 3. His & Hers Vow Books from Noteworthy Designs. The shop will write your names in calligraphy on the first page of your vow books, which I loved. 4. Will You Be My Bridesmaid? cards from Natty Michelle. My bridesmaids loved their cards! Natalie sent me a thank you card with it that I felt was a nice touch. 5. DIY Cake Topper Set from Pretzel Tree. I requested pink and white flowers to match my wedding colors and the shop created a custom listing for me. I then painted my own topper, which I found to be fun and easy to do. The packaging was cute, too. 6. Custom Address Stamp from Note Trunk. I absolutely love this stamp, and I regularly use it. I’m definitely ordering another if we ever move.